If your efforts at home-growing have earned you “brown thumb” status, don’t give up the garden just yet. TNW Deals has carved out a great offer on a foolproof, self-contained hydroponics herb garden – now you can grow herbs in the convenience of your own home, with a complete setup for just $59.99. 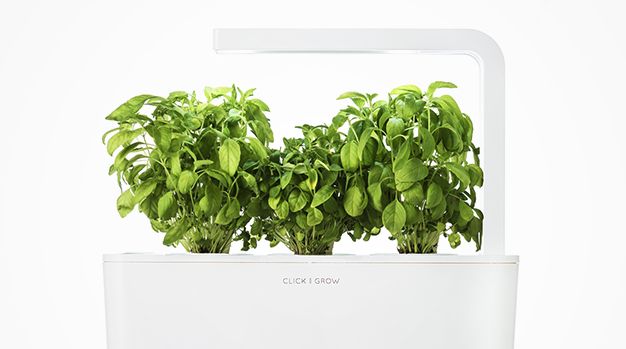 The Click and Grow garden system makes it easy and fun to grow your own herbs, and it’s an extremely easy setup: put the pots in the device, add water, and plug it in. That’s it! The herbs are provided in pre-seeded pots with Click and Grow’s specially formulated soil, entirely free of GMOs, pesticides, fungicides, insecticides, plant hormones, and all other suspicious substances. Each set comes with three herbs. This kit offers thyme, basil, and lemon balm, a nice starter herb selection for your budding garden, as well as chili pepper, salad rocket, and mini tomato for your consideration. Go for variety on the included 3-Pack Refill as well. Once it’s all set up, you’ll plug in the LED light, and let nature run its course. If the water needs to be replenished, the light starts blinking for a quick fix. Tips included will give you key advice on positioning for adequate light, as well as overall best practice options for a thriving garden. For a limited time, you can take 24 percent off the Smart Herb Garden Starter Kit & 3-Pack Refill, and give yourself a running head start in the quest for that elusive green thumb!